Gjestekurator Sarah Schipschack leder en 16 mm workshop på AMIFF i regi av Polar Film Lab, en analog filmlab basert i Tromsø. Verkstedet er åpent for alle og krever ingen forhåndskunnskaper. Barn er veldig velkommen. Ikke gå glipp av den unike sjansen! Gå heller ikke glipp av Polar Film Labs "live cinema performance" tilknyttet workshopen, fremført av Britt Al-Busultan fra Finland med 16mm prosjektorer, håndlagede filmruller, speil og diverse gjenstander. Les mer om gjestekurator Sarah og hennes kuraterte kunstprosjekt på årets AMIFF på side 14-15. Les mer om Polar Film Lab, 16 mm verkstedet og performancen "Razzle Dazzle" her. Polar Film Lab is an association providing a place for analogue film in Tromsø and it is unique in Norway. The lab is a local and international platform and we supply working facilities, film screenings, master class and workshop to improve the opportunities for artists working with film and create a place for exchange and engagement of ideas and experiences around filmic creation and expand the knowledge around analogue and experimental film. Our aim is to keep analogue film alive and accessible and to promote its transformation into the future. With the ever-evolving conditions surrounding analogue filmmaking, it’s vital to have local film labs to provide working facilities, knowledge, and both a creative and conceptual framework surrounding analogue film. This not only facilitates and maintains the practice of filmmaking, but also furthers its development and adaptation into the future as well as enhancing its hands-on qualities through local characteristics.The lab is runed by their founders Emilija Skarnulyte and Sarah Schipschack. The Polar Film Lab will direct a filmmaking workshop on AMIFF where the participants will learn to manipulate the film material by painting, coloring, spraying and masking to create an own 16mm film. The aim of the workshop is to introduce all the participants to basic of abstract, handmade filmmaking. We will give all participants a blank film stripe and we provide all materials to make your own analogue film. The handmade films will be shown in the end and we will use different techniques, e.g. double projections and sound manipulation to widen the experience of making your own experimental film. Nicolas Siepen vil holde et tre-dagers seminar på festivalen, der du vil bli invitert til å aktivt engasjere deg med programmet innen 'bevegelige bilder' på festivalen. Om du er interessert i bevegelige bilder, altså videokunst, eksperimentell film og tidsbaserte installasjoner og skulpturer, eller en aktør innen kunst og/eller film, så er du hjertelig velkommen. Seminaret er strukturert rundt tre økter, en hver dag, på hver 2,5 timer fredag 20. oktober til søndag 22. oktober, der gruppen blir invitert til å delta aktivt i diskusjoner om utvalgte verk som vises på festivalen og hvordan disse forholder seg til aktuelle diskusjoner i kunstverdenen og i henhold til bevegelige bilders praksis. Temaer som kuratoriske problemer, lokaler og festivalens struktur vil også kunne diskuteres, og det er mulig å reflektere over eventuelt eget arbeid i forhold til diskusjonen. Seminaret er for kunstnere, filmskapere, kuratorer, skribenter, forskere, studenter og andre som er engasjert med film og bevegelige bilder innenfor sin egen praksis, eller de som bare er interessert i bevegelige bilder. Deltakerne vil bli forventet å delta på hver økt og å bidra med å bestemme programmet gjennom en kombinasjon av åpen, kritisk respons og selvrefleksjon. Workshopavgiften inkluderer adgang til de utvalgte visningene på festivalen som vil diskuteres på workshop'en. Nicolas Siepen er kunstner, filmskaper, forfatter og forlegger, som for tiden er professor ved Tromsø Kunstakademi. Nicolas Siepen will hold a three-day morning seminar at Arctic Moving Image & Film Festival. The seminar will respond to and actively engage with the 'moving image' programme of the festival. It will be structured around three, two and a half-hour long sessions every morning from Friday 20 October to Sunday 22 October (9.00am-11.30am) at Harstad Scandic Hotel, where the group will be joined by artists involved in the festival. The members of the group will be invited to actively participate in the sessions, and reflect upon their own work if applicable. Seminar participants will also attend the festivals screenings free of charge, and draw upon and interrogate their responses to these – extending from themes, issues, curatorial premises and the festival’s structure itself to individual works as they relate to a developing, ongoing conversation around contemporary moving image practices. The seminar is for artists, filmmakers, curators, writers, researchers, students and others engaged with film and moving image within their own practice. Also people who have no professional link to film and moving image, but who are interested in learning more about the field, are invited. Participants will be expected to attend every session and to fully contribute in determining the programme through a combination of open, critical response and self-reflection. Tickets: NOK 50,- Your place on the seminar includes a free festival pass. Limited places. We will email you with more information before the seminar starts. Egypt, Syria, Iran og Libanon. //Presentation by curator Anastasia Patsey+filmclips+panel with Kjetil Jacobsen and Jon Nordenson, about the role of social media and moving image´s role in revolution, with film screenings from Egypt, Syria, Iran and Libanon. Se lenger ned for å kjøpe billett til enkeltvisninger av utvalgte filmer. //Scroll further down to buy tickets for the separate screenings of Rabih Mroué, The Pixelated Revolution (2012) Duration: 60’00”, Bani Khoshnoudi, The Silent Majority Speaks (Egypt/Lebanon, 2014) Duration: 94’00" and Lara Baladi, Alone, Together... In Media Res (2012) Duration: 42’00”. Moijtaba Mirtahmasb — says: “Listen, Jafar. What matters is that this is documented. archives and transmitted an independent, unfiltered vision of the revolutions. questions that the discussion will be built around. presents works by artists and filmmakers that are based on authentic nonprofessional footage created by participants of revolutionary events and shared on social media platforms. In opposition to professional documentaries and other films, many of which were released in cinemas, the selected works are nor a historical chronicle of the revolutions, neither an illustrative compilation. “These Cameras Stay On” presents examples of collaboration between the artist and the anonymous operator, the dual character of the protestor as agent and object of change, the new languages and toolkits of civil resistance. Bani Khoshnoudi, The Silent Majority Speaks (2014) Duration: 94’00"
Khaled Hafez, The Video Diaries (2011) Duration: 06’19"
the Egyptian revolution in January and February of 2011. Referring to the concept of “aesthetic journalism” The author combines his own original video footage with stock images, materials from TV reports and social media and forms several parallel narratives that intertwine on the three screens. The film is accompanied by a music piece that creates a simulated fictitious atmosphere and mediates the feeling of intimacy and nostalgia. The Video Diaries capture “the immediacy of that minute-to-minute transition, away from autocracy and oppression and towards a new, albeit uncertain, future for Egypt” (Allam Y. Khaled Hafez and the art of Revolution – from Premonition to Stockholm Syndrome. P. 130). Premonition to Stockholm Syndrome. P. 127). Kjøp billett "The Pixelated Revolution"
the Documentary Film. Ed. Aitken I. Vol. 1. New York: Routledge, 2006. P. 315.). of the questions that Rabih Mroué investigates in his lecture-performance. Bani Khoshnoudi, The Silent Majority Speaks (Egypt/Lebanon, 2014) Duration: 94’00"
kjøp billett "The Silent Majority Speaks"
The latest revolt in Iran serves as a launching pad and as lens for the artist to explore ideas of collectivity, authority, patriarchy, memory and repetition by re- assessing or deconstructing images of the country’s modern history. Connecting and disconnecting found footage and certain moments of a shared revolutionary consciousness, the work presents a reflection through cinema and the art of the moving image on revolutionary obsessions and a new version of modernity. 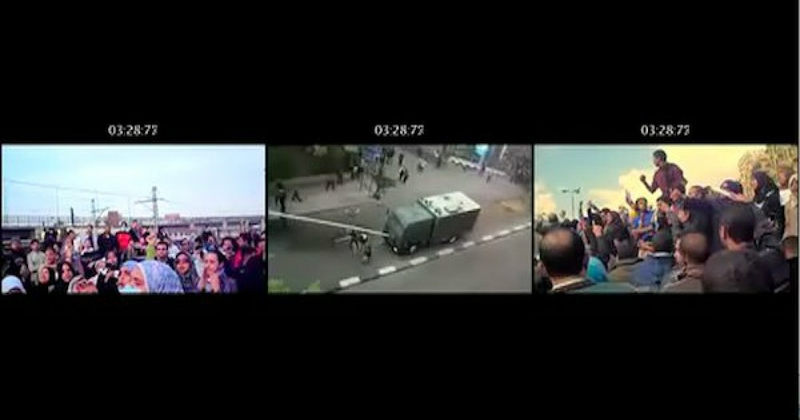 The Silent Majority Speaks uses archival film material of revolution, collective moments of resistance, found footage and author’s own recordings of the protests of June 2009. Mobile phone reports from YouTube play an important role in the narrative of the film and demonstrate the potential of collective internet archiving. The film was nominated by Nicole Brenez for the PRIX SCRIBE in France, and had its first public screening in 2014 at Lincoln Center in New York as part of the ART OF THE REAL film series. Dennis Lim, Director of Programming, Film Society of Lincoln Center described the work as a “eloquent inquiry into the notion of a collective memory, as well as a vivid and urgent corrective to political amnesia”. Bani Khoshnoudi (b. 1977) studied photography and film. Since 1999, when she started making her first films, she was active as the artistic director and production coordinator for the documentary series produced in collaboration with European TV channels, founded her own production company “Pensée Sauvage Films” and curated a number of film programmes. In addition to filmmaking, Bani Khoshnoudi creates experimental media installations as a visual artist. Her projects have been exhibited in galleries in Europe, USA and the Middle East. kjøp billett "Alone, Together... In Media Res"
constitution, censorship, violence against women. two important media initiatives: the public Tahrir Cinema and the online Radio Tahrir. archive on and for the revolution. nonconformist art (MoNA) that she currently holds. Kjetil Ansgar Jakobsen (født 18. september 1965) er en norsk historiker og sakprosaforfatter. Fra 2011 til 2014 var han Henrik Steffens-professor ved Humboldt-universitetet i Berlin. Jakobsen er spesialist på nyere fransk, tysk og norsk kultur- og idéhistorie. Hans forskningsområder er kosmopolitisme, globalisering, mediehistorie og mediefilosofi. Fra 2015 er Jakobsen professor i historie ved Nord universitet i Bodø. Jon Nordenson er postdoktor ved Institutt for kulturstudier og orientalske språk i arabiske studier. Han ble tildelt "Babylonprisen" i 2011, delt ut av "Babylon - Nordisk tidsskrift for Midtøsten og Nord- Afrika" for beste bidrag fra yngre forskere. Han er forsker i prosjektet "Climate Change and Energy Transition in the Middle East - Discourse, practice, and state-society relations (GreenMENA)." Jon skrev doktorgradsavhandling med spørsmål: Legger internett til rette for demokratisering og annen politisk og sosial endring i Midtøsten?